Under what local brands and in what dosages is generic Amoxicillin & Clavulanate sold in pharmacies of Britain, United States, and Canada? 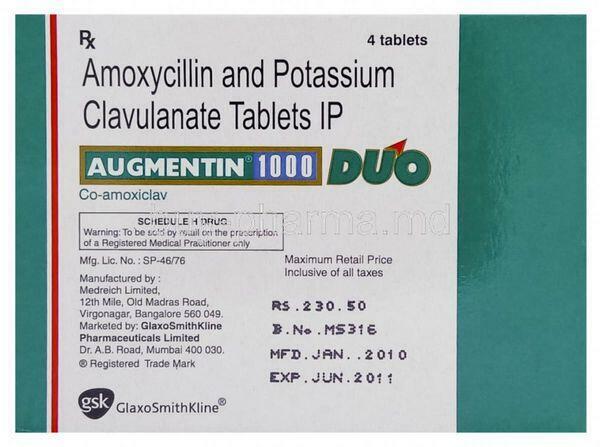 Amoxicillin/clavulanate (GlaxoSmithKline’s Augmentin, Augmentin ES, Augmentin XR, generics) is a combination of the semisynthetic antibiotic amoxicillin and the β-lactamase inhibitor clavulanic acid. The product is available in immediate-release tablets, extra-strength and extended-release tablets, oral suspension, chewable tablets, and parenteral form (in Europe only). GlaxoSmithKline is attempting to retain sales of its amoxicillin/clavulanate franchise with the branded Augmentin XR and ES formulations, following the market entry of generic competitors to Augmentin in 2002. The drug has a broad spectrum of bactericidal activity against many gram-positive and gram-negative microorganisms and has been a favorite among clinicians because of its efficacy, safety, and familiarity. The formulation of amoxicillin and clavulanic acid in the combination drug protects amoxicillin from degradation by β-lactamase enzymes that bacteria might release and effectively extends the antibiotic spectrum of amoxicillin to include many bacteria normally resistant to amoxicillin and other β-lactam antibiotics. The antibiotic component functions by disrupting bacterial cell-wall synthesis. A clinical trial compared the efficacy of amoxicillin/clavulanate (250/125 mg three times daily for ten days) with ceftibuten (Schering-Plough’s Cedax, generics), a third-generation cephalosporin, 400 mg once daily for five days in 335 adults with acute exacerbations of chronic bronchitis. Clinical response was equivalent between the two arms, with cure or improvement in 92.4% of ceftibuten-treated patients and 92.7% of amoxicillin/clavulanate-treated patients. The incidence of adverse events was also comparable, in approximately 15% of patients. Amoxicillin/clavulanate’s efficacy, safety, and dosing may account for the longevity of this combination in clinical use. However, in certain defined geographical areas, the emergence of S. pneumoniae strains with elevated MICs (which indicate lower susceptibility to the agent) has been observed. To meet the need of treating drug-resistant S. pneumoniae, high-dose amoxicillin/clavulanate formulations have been developed that are active against some resistant bacterial strains. An enhanced dosage form of amoxicillin/clavulanate 2000/125 mg twice daily (GlaxoSmithKline’s Augmentin XR) has been developed for use in adult respiratory tract infection. This enhanced formulation prolongs the time that bacteria are exposed to the antibiotic and promotes coverage of tough-to-treat S. pneumoniae with reduced susceptibility to penicillin, as well as β-lactamase-producing H. influenzae and M. catarrhalis. Amoxicillin/clavulanate is generally well tolerated. The most frequently reported adverse effects as reported in the product insert were diarrhea/loose stools (9%), nausea (3%), skin rashes and urticaria (3%), vomiting (1%), and vaginitis (1%). The overall incidence of side effects, and in particular diarrhea, increased with the higher recommended dose. In clinical practice, diarrhea and loose stools are the most frequently reported side effects, although these tolerability issues can be minimized by taking the product with food and rarely result in discontinuation of treatment. Other less frequently reported reactions include abdominal discomfort, flatulence, and headache. Piperacillin/tazobactam (Wyeth/Taisho’s Zosyn) combines the extended-spectrum penicillin piperacillin with the β-lactamase inhibitor tazobactam. Commercially available since 1993, piperacillin/tazobactam is available for parenteral administration only. U.S. patent expiry is expected in 2007. As a β-lactam/β-lactamase inhibitor combination therapy, the tazobactam component protects the antibiotic from degradation by β-lactamase enzymes released by bacteria, thereby extending the effective spectrum of the therapy to treat bacteria resistant to the β-lactam antibiotic component (piperacillin). Like other β-lactam antibiotics, piperacillin/tazobactam achieves its bactericidal effect by interacting with penicillin binding proteins and disrupting bacterial cell-wall formation. Piperacillin’s broad range of activity (which includes many gram-negative organisms such as P. aeruginosa and K. pneumoniae) is enhanced by the β-lactamase inhibitor tazobactam, effectively extending the spectrum of activity to include H. influenzae. Piperacillin/tazobactam is used for severe and/or complicated acute exacerbations of chronic bronchitis episodes in hospitalized patients in whom broad (gram-negative) coverage is required. A Japanese multicenter comparative study of the use of piperacillin versus piperacillin/tazobactam in chronic respiratory infections demonstrated comparable clinical success between these therapies. The study enrolled a total of 173 patients with chronic RTIs. Eighty-five study subjects were treated with 2 grams of piperacillin IV twice daily for 14 days, and 88 subjects were treated with piperacillin/tazobactam (2 grams/500 mg) combination therapy for 14 days. The clinical response was comparable, with 81% and 86% of subjects achieving favorable outcomes, respectively. In clinical trials of piperacillin/tazobactam, 90% of the adverse reactions were transient and mild to moderate in severity. The most significant side effects reported include skin rashes/pruritus, GI complications (including diarrhea, nausea, and vomiting), and allergic reactions (in 1.3%, 0.9%, and 0.5% of treated patients, respectively).